The CSE Annual General Meeting will take place on Monday, October 23, 2017 between 5:30 PM – 7:00 PM at the Vancouver Convention Centre, Room 116/117. Please contact CSE at cse@ccs.ca if you have any questions or additional items that you would like to discuss at the meeting. Congratulations Dr. Dr. Chi-Ming Chow for being selected to receive the 2017 CSE Annual Achievement Award! This award recognizes Canadian cardiologists who have made significant contributions to echocardiography in terms of leadership, teaching or research. The award will be presented during the Canadian Cardiovascular Society Awards Ceremony on Sunday, October 22, 2017 between 6:15 PM – 8:00 PM at Vancouver Convention Centre, Waterfront Ballroom. It is hoped you will attend to congratulate your colleague in person! The CSE Annual Achievement Award will be presented at the CCS Awards Ceremony. Please join us! We would like to wish a happy Sonography Week to all our sonography members and colleagues! The 2017 meeting was very successful again with close to 650 participants. The meeting in 2018 will be held in Toronto from 12 to 14 April 2018. Please mark your calendar and hope to see you there. The registration website will be up in Jan 2018. The 19th Annual CSE Meeting Registration Site Is Now Open ! The 19th Annual Canadian Society of Weekend will be held from 20 to 22 April, 2017 at the Toronto Marriott Downtown Eaton Centre Hotel. We have developed an exciting educational program for you. The Annual Canadian Echo Weekend is designed around your needs and requests over the past eighteen meetings. We will focus on common clinical problems encountered in your practice and the important role that echocardiography plays in diagnosis and patient management. Novel and evolving technologies to enhance your diagnostic capabilities and improve patient care will be highlighted. We are excited to bring to you this year a new 3D Echocardiography Made Simple! A Hands- on Analysis Workshop. These ticketed sessions will focus on the analysis of 3D echocardiographic datasets. The aim of the workshop is to review 3D cropping methods and currently available left ventricular and mitral valve analysis packages. We have recruited Canadian and International leaders to lead these sessions using equipment from GE and Philips. The sessions are limited to 13 people each to allow sufficient interaction and support. New this year is a 2D Strain Made Simple! A Hands-on Analysis Workshop. The tutors will guide you again on either GE or Philips workstations in the application of 2D strain in clinically meaningful situations. In addition to top-tier Canadian speakers, this year’s guest speakers include Dr. Erwan Donal, Echo Section Head of European Association of Cardiovascular Imaging (EACVI) who will be presenting a comprehensive and cutting edge talk on The Role of Echocardiography in Atrial Fibrillation and Dr. Susan Wiegers, Immediate Past President of the American Society of Echocardiography (ASE) who will be presenting on Appropriate Use and Value of Echo. 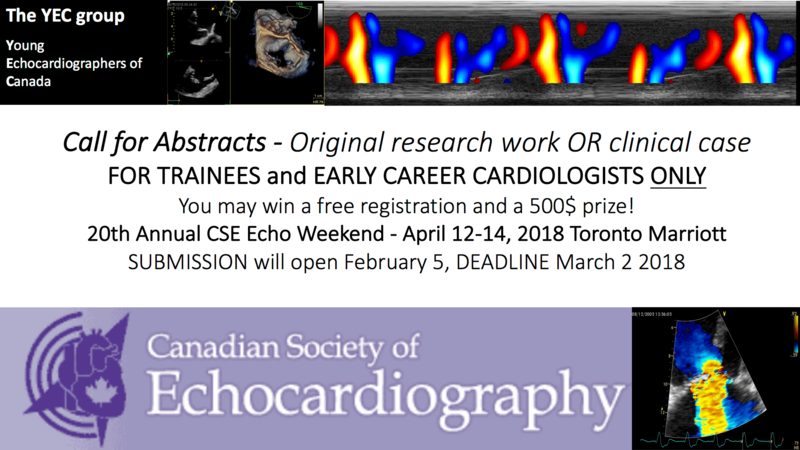 Our Young Echocardiographers of Canada, led by Dr. François Tournoux, will be hosting an Echo Jeopardy Tournament and a Research Poster Competition, and will be welcoming Dr. Julia Grapsa, the past head of the EACVI’s Heart Imagers of Tomorrow. The faculty is looking forward to seeing you again this year at the 19th Annual Canadian Society of Echocardiography Weekend.